Dedication: Ramsey & Murray is a nationally recognized law firm with over a half-century of experience providing exceptional legal services to clients who do business in Texas. Our focus is on representing insurance companies, their insureds and self-insured businesses to achieve the positive results our clients have come to expect from our firm. Our attorneys are known by our clients, our adversaries and judges at the federal and state level for our dedication, aggressiveness and outstanding results, as well as our commitment to ethics and professional courtesy. Ramsey & Murray, P.C. has received the prestigious AV Preeminent Peer Review Rating by Martindale-Hubbell, the highest recognition possible in the legal industry for professionalism and ethics. Our firm is also listed in the Best's Directory of Recommended Insurance Defense Lawyers. Experience: Ramsey & Murray's litigation, trial and appellate experience covers a wide range of practice areas, both in State and federal courts, including: General Civil Litigation Insurance Defense Self-Insured Defense Insurance Coverage Personal Injury Defense Hurricane/Windstorm Premises Liability Construction Defects Toxic Torts Alternate Dispute Resolution Auto/Truck Accidents Work-related Injuries Ramsey & Murray, P.C. proudly serves clients who conduct business or become involved in disputes anywhere in Texas and routinely handles cases in the following Texas Counties: Harris, Montgomery, Fort Bend, Galveston, Brazoria, Jefferson, Orange, Waller, Travis, Dallas, Tarrant, Bexar, Liberty, Chambers, Austin, Colorado and Wharton. Unsurpassed Client Service: At Ramsey & Murray, P.C., we believe the success of our law firm is tied directly to the success of our clients, which is why you can expect our attorneys to always handle your case with the skill, professionalism and individual attention it deserves. We have extensive trial experience and we excel at researching the law, interviewing witnesses, collecting records, conferring with expert consultants, planning legal strategy, preparing and filing pleadings and negotiating with opposing counsel. We work hard to obtain a result in the best interests of our clients. Contact: Call us at 713-613-5400 or Email us at mramsey@ramseyandmurray.com. Defending your legal rights against fraudulent claims: With personal injury claims on the rise, the need for a qualified and experienced personal injury defense attorney is growing every day. 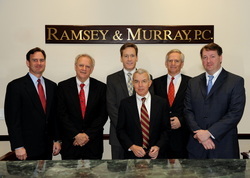 The attorneys at Ramsey & Murray, P.C. 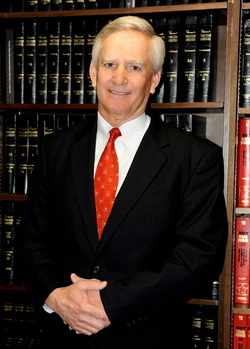 have, for over fifty years, defended large corporations, professional services firms, property owners and managers, insurance companies, construction and other contractors, health care providers and individual professional in personal injury lawsuits against plaintiffs seeking damage awards, including punitive or exemplary damages. At Ramsey & Murray, P.C., our personal injury defense attorneys have successfully represented many businesses, insurance carriers and their insureds against plaintiffs in cases involving legitimate claims and damages or false claims with exaggerated demands, including cases involving: Unsafe premises Engineering and design failure Construction and design accidents Auto, truck, motorcycle, ATV, 18-wheeler and aircraft accidents Defective products Industrial accidents Wrongful death Product liability Chemical and toxic material exposure Machinery accidents and operator negligence Negligent hiring/supervision Home and commercial property damage Providing rapid and accurate defense: Our attorneys are well versed in Texas' personal injury and tort laws and provide effective and diligent representation to expedite and ease resolution of conflicts, or aggressively defend lawsuits, depending on your needs. Consulting with us early in the claims process enables us to thoroughly collect witness recollections when they are fresh and when evidence remains available. Our attorneys' vast courtroom experience and rich history of successfully handling hundreds of personal injury cases, combined with professional input from medical experts and other professionals enables us to develop a highly-effective defense that judges and juries favorably respond. Whatever the injury or property damage, our attorneys possess the extensive litigation experience needed to vigorously represent you against any personal injury claim which may cause harm to you or your business Contact a Texas personal injury defense law firm: Call 713-613-5400 today or Email us at mramsey@ramseyandmurray.com. Mr. Ramsey is AV Preeminent Peer Review Rated by Martindale-Hubbell, the highest recognition possible in the legal industry, for his professionalism and ethics. Ramsey & Murray, P.C. proudly serves clients who conduct business or become involved in disputes anywhere in Texas and routinely handles cases in the following Texas Counties: Harris, Montgomery, Fort Bend, Galveston, Brazoria, Jefferson, Orange, Waller, Travis, Dallas, Tarrant, Bexar, Liberty, Chambers, Austin, Colorado and Wharton.